Clearly, Doom's departure from Astonishing Tales was abrupt, since the final panel of his last installment (issue 8) advertises a story, "Deathmasque," which never appeared, so maybe Everett was working on that story when Doom's series was dropped. Or maybe he was slated to return to Sub-Mariner earlier than #50--Dr. Doom had appeared just a few issues earlier, so maybe he had drawn some pages for #47 or #48 before they decided to keep Gene Colan on board a little longer? 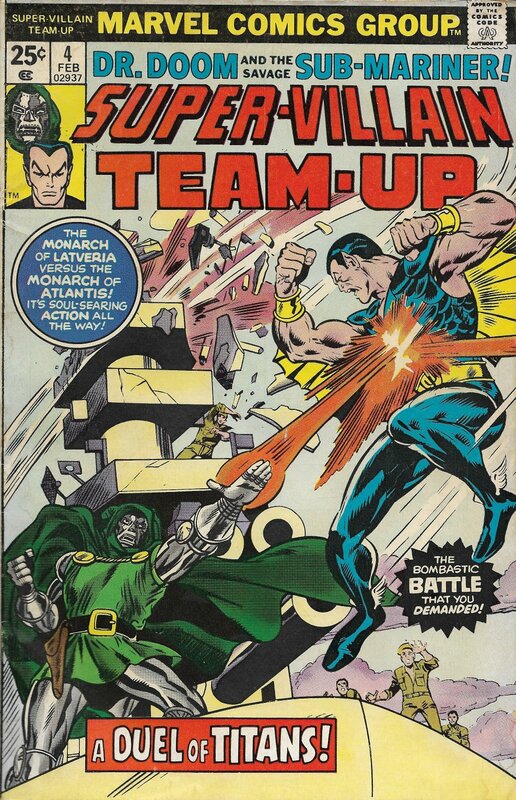 Sub-Mariner #47 had a similar title, Doomsmasque. Everett inked the cover of that issue. How anyone at DC thought these kinds of tired-looking covers, with the horrid lettering and the clunky logos so typical of this time at DC (Man, do they make you miss Ira Schnapp!) would entice a new reader, I'll never know. I bought these kinds of books for the reprints, but if I were a new fan? Can't imagine that these covers would make anyone want to pick these up. This takes me back. One of my very earliest comics. And a series I dearly love, even if nobody else does. The short story that begins in issue 14 is one of my all-time favorite comic stories. I foolishly started with this #1 issue, and am pretty sure (if my memory from 20 years ago is correct) that somewhere in this issue an asterisked note from the editor refers to "last issue". Since this was #1, that confused my young brain for many years. 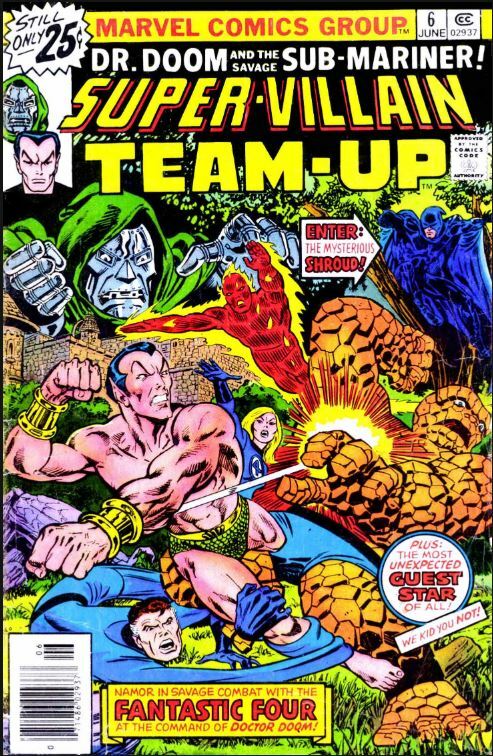 There are a whopping nine footnotes in this issue, including a couple of references to the earlier installments, but they're called "Giant-Size Super-Villains" rather than the correct "Giant-Size Super-Villain Team-Up". What you are remembering is not a footnote, but the very first caption box: "The time: minutes after the defeat of Andro's android army last issue." If you wanted a super-villain team-up with multiple guest stars ala Marvel Team-Up, there was always DC's JOKER series. 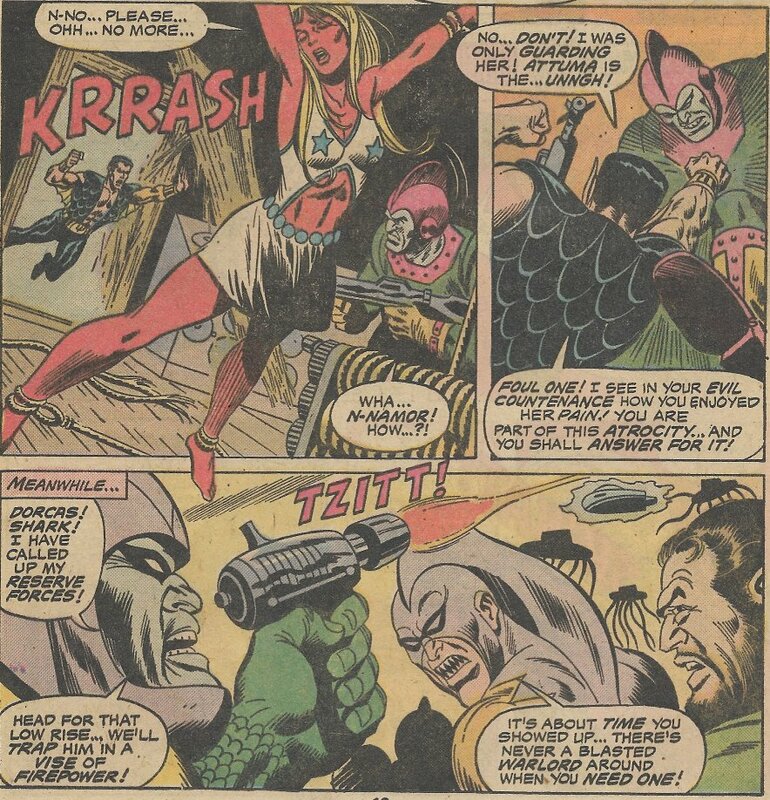 Namor, freed but still weakened, attacks Dr. Dorcas, who has killed Betty Dean Prentiss. Tiger-Shark and Attuma are holding him off, but Doom uses a stun-shock to subdue Tiger-Shark, Attuma, and Namor. Revenge on Dorcas, he argues, is beneath them, and not in his plans, and he teleports himself and the furious Sub-Mariner back to his ship. 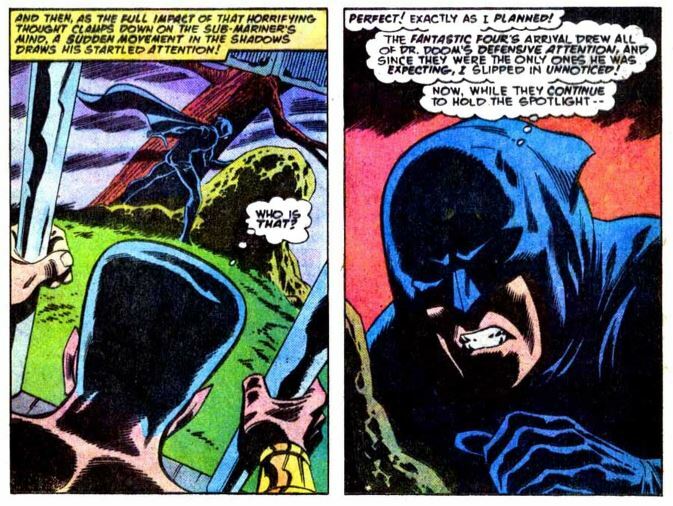 Namor passes out and comes to in the comfort of Doom’s Latverian castle, where Doom reveals he has changed his mind—they will avenge Betty on Dorcas. This is only the second issue in the five so far that seems like it was generated fully and specifically for this series. It’s a legitimate team-up, and although the tensions remain high, the alliance stays intact at the conclusion. Inconsistent creative teams have plagued the young book, but it was a relief to have Jim Shooter step in here and clean up the mess. We’ll see Shooter back on this book soon, but in an unusual role. George Evans is back, and delivers a better job than last time he provided pencils, but he’s not a great match for the material. We’re apparently done with the leftovers from the Sub-Mariner’s solo series. Dorcas dies conveniently before his name becomes a popular slang insult. Betty’s gone. 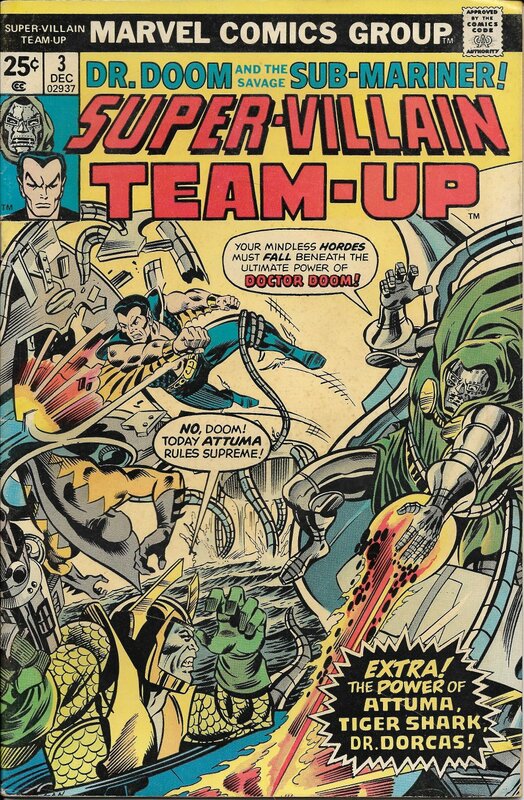 Hydrobase is still around, and we’ll revisit it briefly later in the series, but the fate of it and the Hydro-Men would be wrapped up in, unsurprisingly, Marvel Two-In-One, the elephant’s graveyard of Marvel’s Bronze Age. The water-breathing alien Tamara has made a few insignificant appearances in this book, only identified by name in this issue, as far as I noticed. I’ve mentioned how lame the Sub-Mariner supporting cast was, and they all seemed pretty pointless in this kick-off three-parter, only there because they had been established as being on Hydrobase. A half-baked—or perhaps half-boiled—start for sure. It does strike me that we haven't often seen Doom straight up murder anyone, have we? I don't know why Saru-San obeyed Doom here, but yeah, Subby, that was murder. The promise of a new direction—or perhaps we might just say “a direction”—was surely greeted with approval by the readers. Who would have been hoping for “more just like this, please”? This issue also features the debut of the letter column, with the very clever title "Bad Tidings" (which I of course swiped for the title of this thread). Comments are on the second regular-size issue. Jay Zilber earns a no-prize for spotting an error: Doom's view from the fish-cam includes the fish-cam itself, which of course is inconceivable. Interestingly enough, with modern technology, that's not at all far-fetched. Peter Sanderson, later a Marvel pro, wants to tar and feather Tony Isabella for killing off Betty Dean, objects to the characterization of Saru-San (no longer an issue!) and gripes about Subby's turn from the pro-peace philosophy he espoused in the 60's. The editorial response doesn't reveal the upcoming new artist, but does promise that the new writer will be Steve Englehart (Whoa, there, friend, you might need to slow it down...). 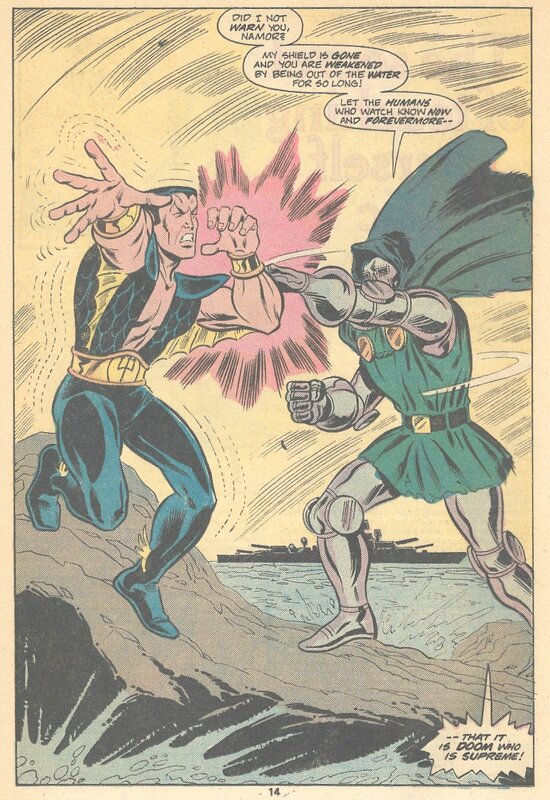 Namor throws Doom into the side of the ship, where Doom creates a big hole (surviving, of course, thanks to his armor). Ryker has a device that (somehow) can siphon (spelled "syphon" here) “power” from Doom. Namor, meanwhile, plunges after being coincidentally stricken by a blast from Doom’s glove, which, Doom assumes, means Namor has died. Ryker’s super-soldier in its “protogen-gel” has been brought to life by the power leeching, but remains in its vat as Doom body slams Ryker and then flies away. Namor, of course, is doing fine below the waves, and he vows never to be used by surface-dwellers again. Another mighty slim plot! The interaction between our leads continues to rehash the same material: team up, break up, slink off to fight another day, swear oaths, vow vengeance…it’s getting extremely tired after only 6 installments. The subplot with Ryker is disappointingly superfluous, since Doom brushes off the power siphoning easily, and Ryker’s test subject is never unveiled. Mantlo must have known this was a fill-in marking time for the belated entry of Steve Englehart, so maybe he intended (or maybe he did) follow this up elsewhere, but the kid that plunked down his quarter had to be satisfied with the Namor/Doom action. 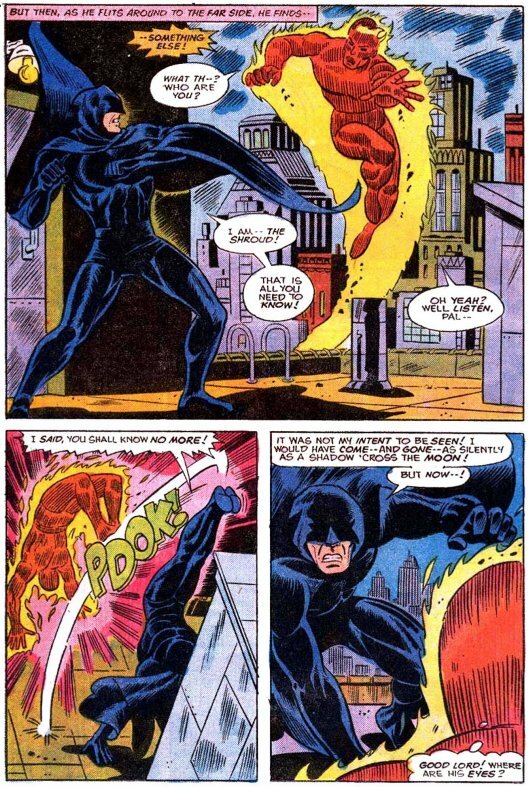 Speaking of action…look, I’m really fond of Herb Trimpe’s work, but he wasn’t delivering much excitement with this job. Just look at that splash page above—it’s pretty lazy stuff, certainly not worth the use of a whole page. But then, it must have been a challenge to stretch this plot out even for a shorter page count of 18 this month. Buckler’s cover is fairly strong, but this issue is definitely a yawner. Comic book fans are accustomed to swallowing a lot of hokum, but the idea that Doom and Namor fighting generates some kind of trackable "energy", and the idea that Ryker would conveniently have a device to siphon said "energy" (What kind of "energy"?His armor's power? Some kind of personal "energy"? Doom's just a regular guy under the armor, right? And Namor's just a strong water-breathing flying mutant--what kind of signature would his "energy" generate?). We never get a clear explanation of what Ryker's super-soldier is. It has a human shape, but is it an android? A cyborg? A corpse? Presumably some kind of precursor to Deathlok, so I'm guessing an enhanced corpse, but Mantlo never makes that clear. 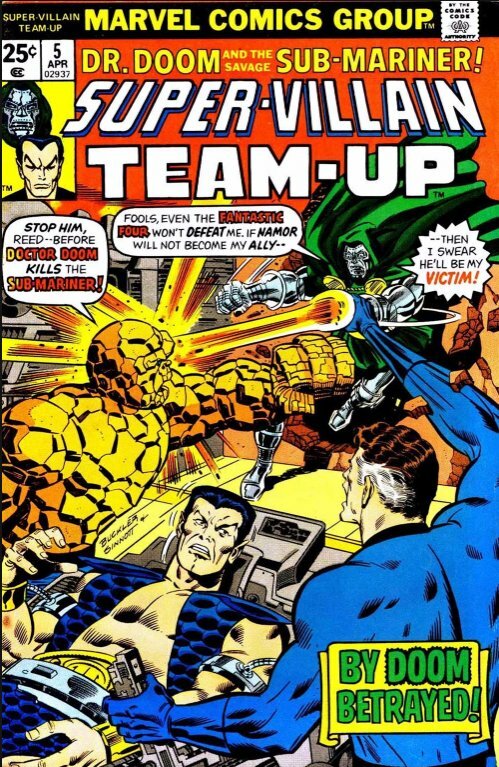 On the letters page, one writer is disappointed that this is not a conventional team-up mag, one agrees that Namor is not a “villain”, and one offers praise but wants some top-tier guest villains to oppose our leads. Among the suggestions is Fu Manchu, and I've got to admit, that might have made for a very good story. It would have made for a missed issue or two when this stuff got collected, but back in the mid-70's, they might have been able to swing that. GCD has amended its credit for the cover's inker from Sinnott to Dan Adkins, who had a similarly shiny style to Sinnott at that point. The subplot with Ryker is disappointingly superfluous, since Doom brushes off the power siphoning easily, and Ryker’s test subject is never unveiled. Mantlo must have known this was a fill-in marking time for the belated entry of Steve Englehart, so maybe he intended (or maybe he did) follow this up elsewhere, but the kid that plunked down his quarter had to be satisfied with the Namor/Doom action. Mantlo and Mooney followed up two months later in Marvel Spotlight #27, a Namor solo story. Thanks for the alert! We'll have to add Marvel Spotlight #27 to the agenda, then! This is the “Symbionic Man”, which mimics the creatures it feeds upon. 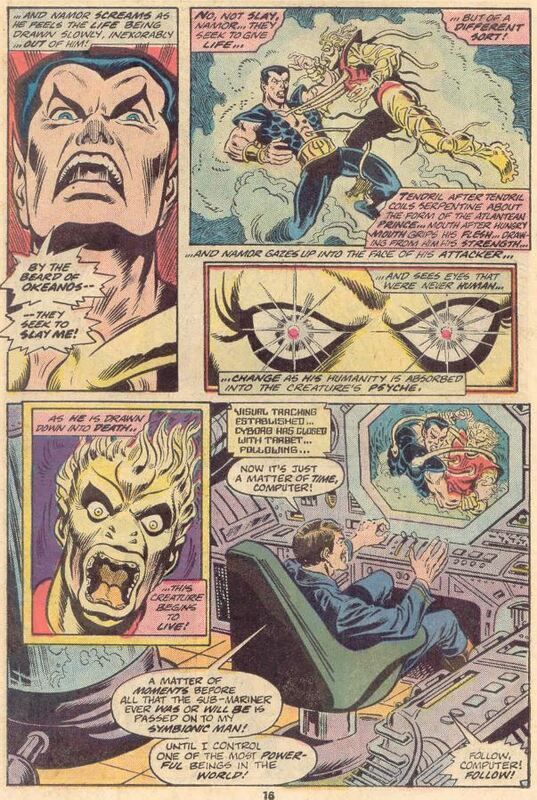 Ryker’s computer, in an approximation of the font used in Deathlok, monitors the creature, which instinctively follows the Sub-Mariner. It leeches on to Namor and begins to absorb his essence. 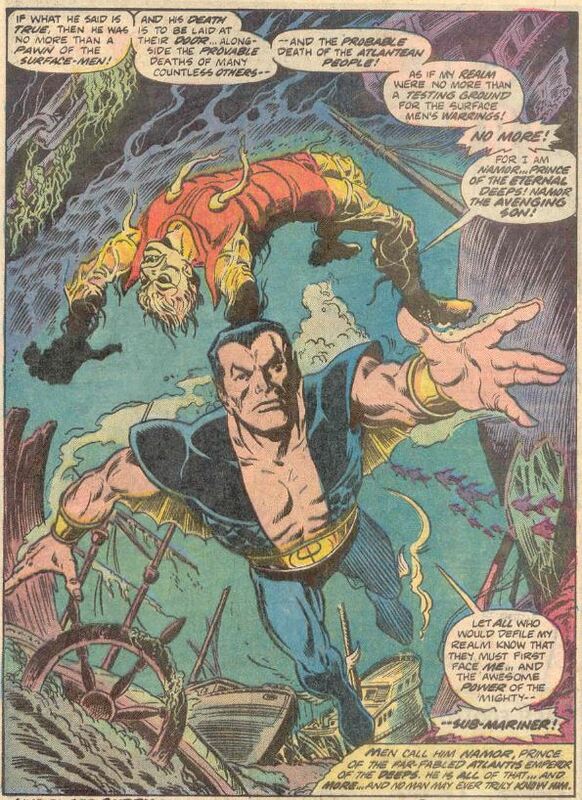 Namor fights him off, and realizes that had he succumbed, he would have been left an empty vessel. 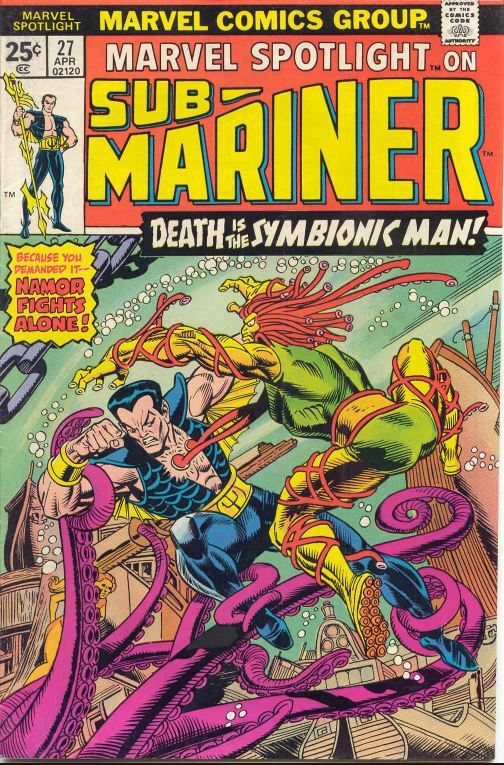 The Symbionic Man takes control of a squid to attack Namor, and begins communicating with Namor, apparently telepathically. Namor begins to be absorbed, surrendering his will, but awakens, inspired by his obligation to his people. 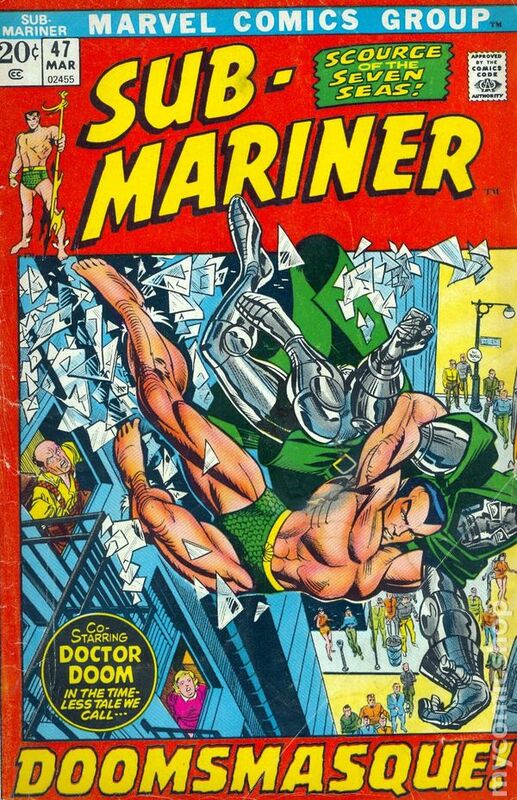 He throws the squid at Ryker’s craft, and the Symbionic Man dies—he didn’t wish to harm Namor, and has learned the nature of life and caring through his short-lived bond with the Sub-Mariner. The End. Thanks to chaykinstevens for the reminder that Mantlo did, indeed, follow up on the threads of SVTU #4 here in this solo Sub-Mariner story. It's really not much more of a story than its predecessor. So, Ryker's creation was a "cyborg", which is usually understood to be a human enhanced with technological alterations; this looks like some kind of sea creature/human hybrid from the start. It doesn't really do much, and the pathos of its story is not very effective. Mooney's work looks pretty good here; he wouldn't have been a bad choice for SVTU if you ask me. There's not much more to say about this issue. It wraps up a hollow story, and it lays a bit of foundation for the Deathlok series, which took place in the near future of the Marvel Universe. I can't imagine that it got many fans eager to see Namor swimming solo again. Namor flies in through Reed Richards’ lab window, requesting aid. Reed flashes back on how he built Namor’s new suit to restore his air-breathing abilities after they were lost due to the nerve gas explosions that led to the current comatose state of the Atlanteans, a suit which is now malfunctioning. Namor recovers consciousness, and relates how Doom has intentionally crippled Namor’s suit, and then takes Namor aboard his craft, returning to Atlantis, where Doom begins destroying buildings until Namor swears allegiance. Doom restores Namor’s air-breathing temporarily, telling him to return to the Baxter Building and see if Reed could repair it. 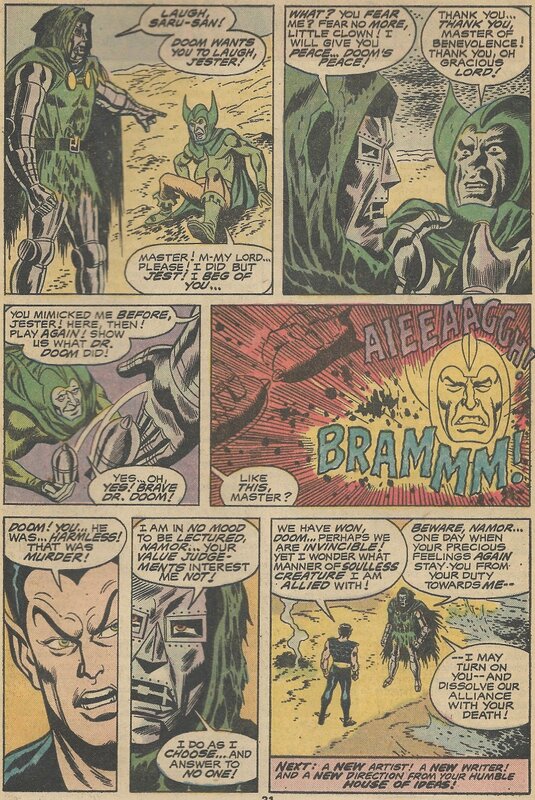 Doom appears before Namor and the FF in holographic projection, explaining that he wants Namor to acknowledge dependence upon Doom, and, secondarily, to prove that Doom could create a challenge that Reed could not solve. 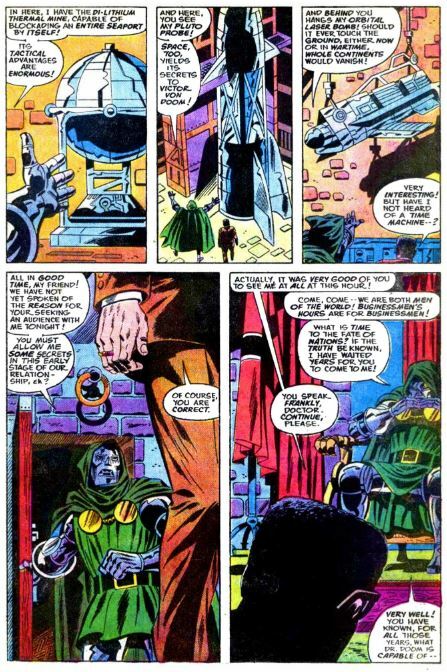 Doom is actually still in Latveria, where he gloats gleefully. The Torch tangles with The Shroud, whose black cape is fireproof, and who then flies away. Johnny asks about his connection to Doom during his pursuit, to which Shroud responds that he’ll do “this” with Doom, and proceeds to demonstrate by flipping, kicking Johnny, and subduing him by choking off his flames with his cloak. By the time Johnny recovers, The Shroud is gone. 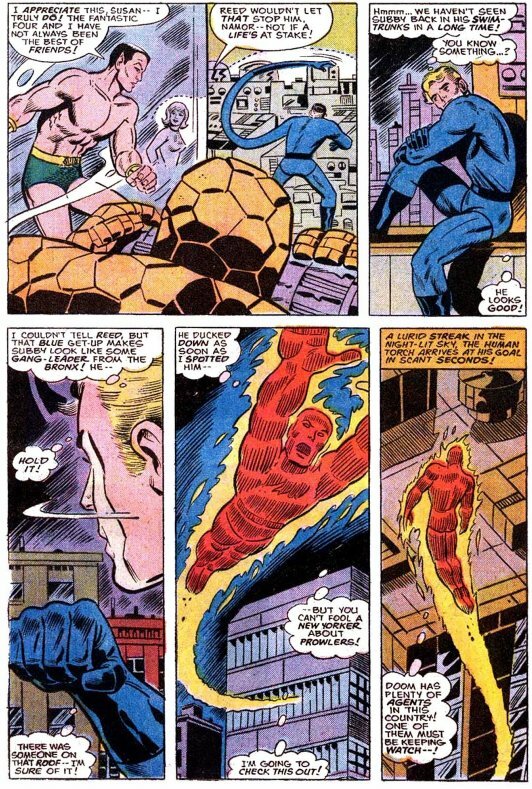 Meanwhile, Reed fixes the suit, but it no longer works on Namor, whose body has been transformed by Doom’s chemicals. Reed has wasted time solving the wrong problem. 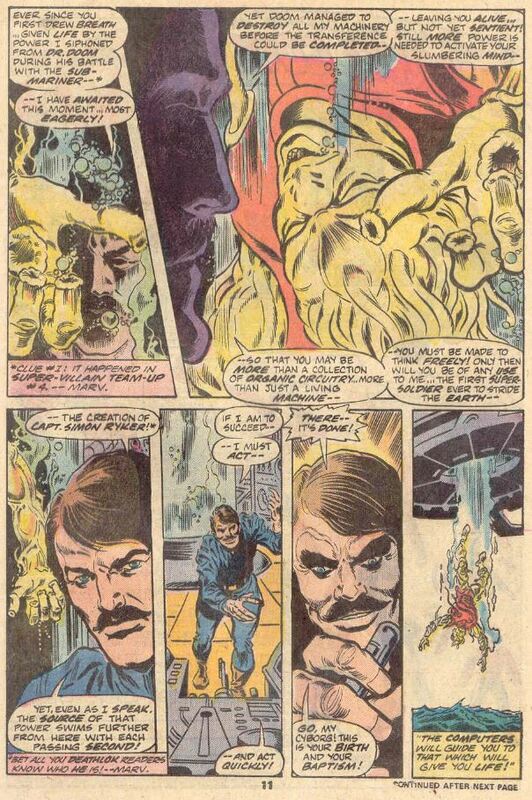 Reed brushes off Johnny’s report on The Shroud, upset at being outwitted by Doom. Time has run out, and even though Reed claims to be close to a solution, Namor rejects him and flies off to satisfy his agreement with Doom. He falters in the air, and begins to fall, but Doom is able to appear again as a projection, and teleports Namor away, with a final warning to the FF: with the addition of Atlantean forces, he will soon conquer them all. We close on The Shroud, whose words suggest that his goal is Doom’s death. Clearly a major step up in quality with the addition of Englehart. The Stainless One seems to have hearkened back to Roy’s words in G-S S-V T-U #1 and is taking advantage of the characters’ links to one of Marvel’s most popular books, Fantastic Four. Doom thrives in contrast to Reed Richards, and it’s refreshing to see the FF here, even if Ben and Susan don’t do much this time. Making this an ancillary FF book seems like a viable option--DC would be milking their "Batman Family" and "Superman Family", so why not do something similar here? The FF will prop up the next few issues, and they are very welcome to do so, I think. This issue provides a contrast that illuminates one of the biggest problems so far: following Doom and/or Namor and/or other, lesser super-villains in virtually every scene has become tiresome and repetitive. Adding a new heroic character in The Shroud gives us some relief from that, as well as some promise of a unique and original supporting cast (even if it turns out to be a very limited cast). It probably provided some protection from Comics Code Authority objections, since technically, “[i]n every instance, good shall triumph over evil and the criminal punished for his misdeeds,” although they seem to have been skirting that one so far. 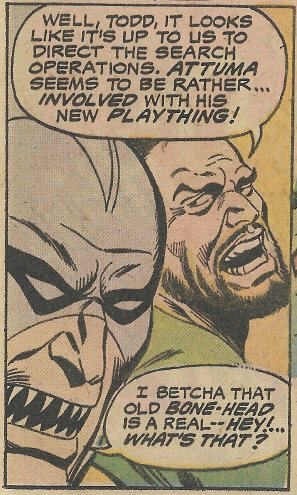 Captain Comet served a similar function in DC's Secret Society of Super-Villains, debuting next month, but Gerry Conway realized much more quickly the need for a heroic complement to the lead characters. Despite having a fairly bland costume, The Shroud is reasonably intriguing, highly suggestive of a Marvelized take on Batman, with a bit of Daredevil (Johnny notices that he doesn’t appear to have eyes). It seems unlikely that this newbie would be able to take down The Torch so quickly, but I guess it gives him some immediate cred, which he’ll need if he seriously intends on taking down Marvel’s No. 1 bad guy. The hint of a link between him and Doom implies an origin more interesting than just deciding to become a mystery man. And "The Shroud" is a pretty cool name, when so many of the good ones already seemed taken! Steve has begun to undo the shake-up in Namor's status quo, first by reverting the costume, next by hinting that Doom can and will revive the Atlanteans. At the time, I really dug the new costume--it was much more in keeping with the standards of the time, and it was striking and unique. The little holes for his ankle wings were kind of odd-looking, necessary though they were. And someone had to revive Atlantis eventually...might as well do it here! I think Trimpe turned in a better performance this time around. As I said before, I do like Trimpe's work, generally, especially in Kirbyesque environments like this one. Perlin's inking is adequate, but not as interesting or as effortful as what he would do inking his own pencils. The Thing is particularly weak, but that's a tricky subject for someone not well-versed in the Marvel look, and Perlin was still new to the Marvel Universe. Nice job, isn't it? Looks like Romita might have had a hand in revisions, as happened so often in those days. I recall that Weiss was once on tap to do a Sub-Mariner revival series that never came about, which is too bad--he'd have been terrific. And Starlin's not too bad on Namor here, either. We open with a silent splash: Namor behind bars, imprisoned in Doom’s castle. Namor, who, the captions tell us, is near 60, but aged only half that in comparison to landlubbers, rages against his captor, Dr. Doom, without whom Namor can not continue to breathe air. But to the rescue come the Fantastic Four, under Doom’s watchful monitoring. Doom attempts to trap the Fantasticar in a tractor beam, then to shoot it down with missiles, then with a gas attack, but the Four survive them all and land. Johnny spots The Shroud’s jet arriving behind them, just before taking on Doom’s android army (much more compliant than the androids of G-SS-VT-U #2). Namor sees the battle from his barred window, and worries that Doom might command him to fight the FF. 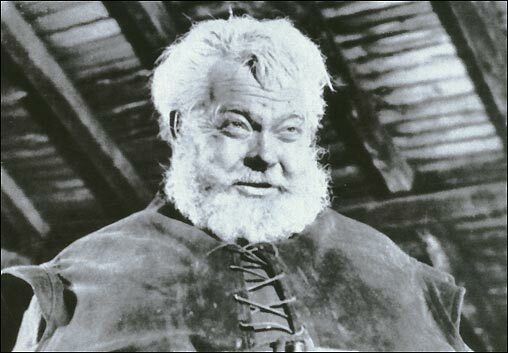 Johnny, too spots The Shroud; he’s the only one of the FF who knows about our mystery man. Meanwhile, the FF have routed the androids, so Doom does just what Namor feared: orders him to battle his rescuers. Always true to his oath, Namor attacks, first, to his own dismay, taking out his former love, Sue Richards. Namor reluctantly fights the remaining three, but succumbs when Sue recovers and brings her force field to the party. …U.S. Secretary of State Henry Kissinger ?! OK, for once, the cover blurb was legitimate--that really is the most "unexpected guest star of all!" Steve Englehart continues to play up the Fantastic Four's connection to our leads, and the results are much more satisfying than previous issues have been. 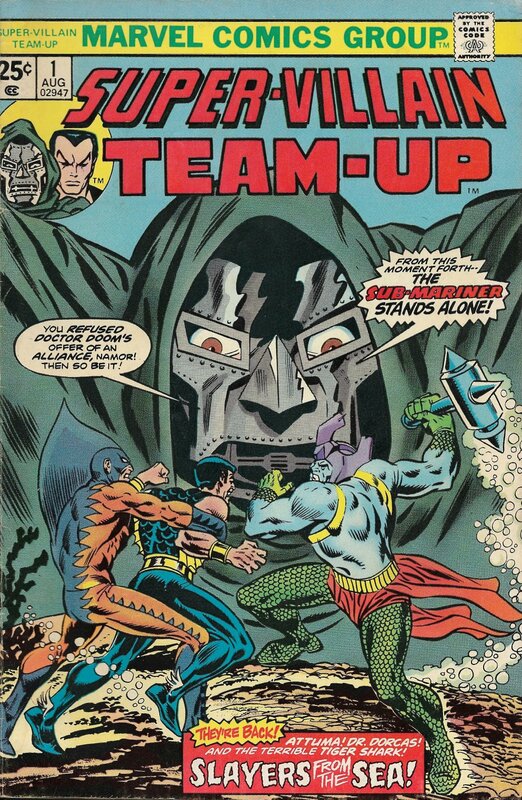 Doom's hold over Namor justifies the "team-up" without making Namor an outright "super-villain". Both our leads show stronger characterization, especially Namor, prideful but subdued and committed to honoring his word, acknowledging his debt to both his captor and his would-be rescuers. Doom displays his arrogant confidence (ignoring the FF as they battle for his castle), his pride in his destructive and amazing scientific accomplishments, his inflated ego and entitlement as ruler, his joy at enslaving his former ally...all in all, a satisfying depiction of both characters. 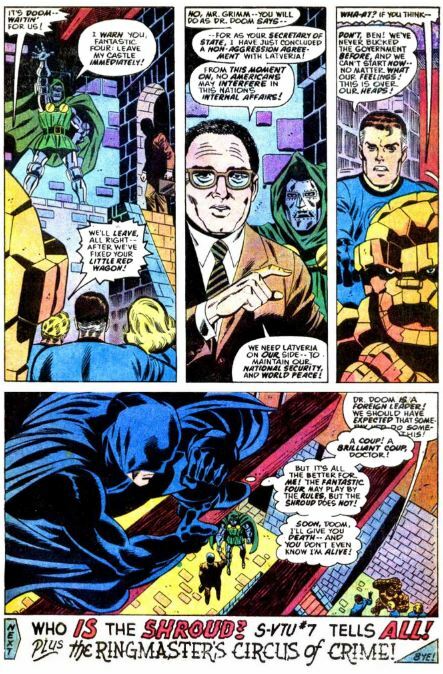 Englehart never got to write Marvel's aborted "The Prisoner" adaptation as he had wanted, but he does get to write this "Prisoner", and again demonstrates his low opinion of the Nixon/Ford administration as Kissinger negotiates peace with the worst villain of the Marvel universe. We get little more information on The Shroud, except to see even more similarity to Batman, as he arrives in his "Shroudplane." Still, two issues is not an excessive tease, as we are promised that next issue "tells all!" And since we probably can't expect the FF to continue to carry the heroic role (especially since they've been warned off of interfering with Doom), a new hero exclusive to this comic is a welcome development. Trimpe's work is a lot more engaging this time around. I've never been especially fond of Jack Abel's distinctive inks, but he suits Trimpe well here. It's nice and "inky" with plenty of black, richer detail, and more impact in the action sequences. There's more than a little of Trimpe's Kirby influence on show here, but that's nothing compared to what awaits us down the pike a ways!